One of Azmodan’s many lieutenants, Ghom is certainly the biggest and hungriest. The Lord of Gluttony is a collision tank that depends on his massive girth and disgusting secretions to secure kills. 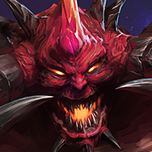 Rumored to have once devoured six angels with one gulp, Ghom terrorizes the battlefield with his gigantic mouth and Trample trait that allows him to damage units and ignore their collision. 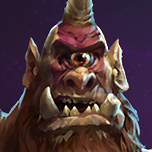 He can easily slow and body block heroes that try to run away by using (Q) Bile Spew and (E) Swell, and his (W) Belch also adds a new mechanic to the Nexus: Confuse. Enemies with the Confuse debuff will move in the opposite direction they are running, then move in the opposite direction of any commands given by the enemy player, but control will not be removed from them like a normal fear. Ghom also has a little potential to escape losing battles with his (W) Belch, and his ults are designed to keep him in the fight longer while also allowing him to create kill potential for his team. Ghom vomits a cone of bile in the direction his is facing. Enemies struck take 180 (+4% per level) damage. Enemy heroes struck have a Bile Puddle created underneath them. Bile pools slow movement by 30% at the middle and decrease in effectiveness towards to edges. Bile Puddles last for 3 seconds. Not targetable, just occurs immediately on button press in the direction he is facing. Ghom channels for 1 second, then belches a noxious gas that applies the Confuse debuff for 1 second. Confused units move in the opposite direction they were moving, then opposite to directions given by the enemy player, but control is never lost. The force of Ghom’s belch also propels him backwards (range 2). Ghom gains 10 armor every second as he grows to a max of 1.5 times his size over 4 seconds. His collision size grows with him, and his movement speed is reduced to 70%. Effect lasts until cancelled. Trample becomes inactive when using Swell. As Ghom grows in size, enemies within his collision radius are pushed away from the center until they are out of his collision area. 25 Demonic Food rains from the sky in a targetable straight line from Ghom (range 10) and stays on the ground for 5 seconds before disappearing. Any food that Ghom consumes heals him for 3% of his health. Ghom’s speed is increased by 50% when moving towards Demonic Food within range 3. Ghom open’s his mouth wide and charges forward (range 3), knocking minions out of the way and biting the first enemy hero he hits. Both Ghom and the enemy hero are rooted for 2 seconds. If the enemy hero is eliminated while Bite is active, Ghom swallows the hero whole and regains 25% of his health. Take 10000 damage while at 40 armor with Swell. Cancelling Swell creates a ring of gas around Ghom that deals 60 (+4% per level) damage per second that Swell was active up to a max of 4 seconds. Confuse 30 enemy heroes with Belch. Heroes hit by Belch are stunned for 1 second before the confuse debuff takes effect. Slow enemy heroes with Bile Pools created by Bile Spew for a total of 60 seconds. Heroes hit by Bile Spew get a green slime stuck on their head that slows them by 30% for 2 seconds. This effect does not stack with the Bile Pool slow effect. Ghom receives 15% more healing from all sources while Swell is active. Standing in a Bile Pool heals Ghom for 75 (+4% per level) health per second. Last hitting minions causes Ghom to swallow the minion whole and regain 50 (+4% per level) health. Hitting a hero with Belch also spawns a Bile Pool. Bile Pools created by Bile Spew reduce enemy armor by 25 while they are standing in them. The distance that Ghom travels backwards when using Belch is doubled. Swell armor max is now 50, but speed is reduced to 60%. Attacking Ghom from behind poisons enemies, dealing 15 (+4% per level) damage per second for 3 seconds. Stacks 3 times. If Ghom loses more than 25% of his health while Swell is at max size, cancelling Swell causes Ghom to explosively deflate. Enemies near Ghom take 240 (+4% per level) damage. Immediately refreshes the cooldown on Bile Spew. Confuse debuff applied by Belch now lasts for 2 seconds. Larder drops twice as much Demonic Food. Additionally, minions have a 25% chance to drop Demonic Food. After the stun is over on Bite, the target is afflicted with a bleed effect that causes 20 (+4% per level) per second. This effect lasts until 25% of the targets health is removed. It can not be cleansed, but healing 25% of the hero's health will assure it doesn't kill the hero. When Ghom is killed, he drops 15 Demonic Food that only his allies can consume. Demonic Food heals for 3% of health. Ghom has a red and white checkered tablecloth on his back with a plate with some spaghetti and meatballs, wine glasses, silverware, and a candle. He’s wearing a tuxedo on his front arms and legs, except where the mouth is. His Q is red and chunky and has meatballs in it. The Bile Pools are now piles of spaghetti. Demonic Food is now Olive Garden Italian food. Pizza, pasta, breadsticks, occasionally a bottle of wine. Ghom has traffic pylons (orange cones), a stop sign, a jackhammer, and a manhole cover on his back. His front end is wearing an orange vest and a yellow hard hat and jeans. Ghom’s Q becomes wet concrete mix. Bile Pools are now wet concrete that leaves footprints in it when you walk in it. Demonic food is now generic fast food. Hot dogs, hamburgers, milkshakes, and occasionally an ice cream sandwich. Ghom has a kiddie wading pool on his back. Inside, there are floaties, pool noodles, plastic buckets, and a super soaker gun. His front half is wearing a white tank top and lifeguard trunks. Ghom’s Q becomes water. Bile Pools become a lifesaver (the safety device, not the candy). Demonic food is now ice cream. Popsicles, ice cream cones, otter pops, and occasionally a quart of Ben and Jerry’s. Ghom gets up on his hind legs, spinning and jumping like a dog. Ghom’s large mouth belches up a Louisiana license plate, sniffs at it, then uses a large tongue to pull it back in. While this is going on, Ghom’s upper body sniffs at his armpit, then waves the odor away from his face and sprays the air with a can of deodorizer. Ghom sticks out a giant tongue and waves his arms. Arms flex while the legs hop excitedly like a dog. Ghom doesn’t really speak, so he’ll have an array of grunts (like Butcher), bodily noises, whistles, and hums. Generic Positive: Belches and laughs. Generic Negative: Farts/blows a raspberry. Ghom: responds with a fart/raspberry that matches the same inflection. Ghom: Barking and whining like a dog. Ghom: Barks like a dog. Ghom: Sniffs a few times, then laughs a lot. Ghom: Hums the first few bars of Happy Birthday. Eventually, you get to him humming a few bars to a few songs. Quite the lard ! @# of a concept if i don't say so myself haha xP is a good take on Ghom though i gotta ask how does his Trample trait work with the large collisions he would also causes? noticed that a few times there and is it a CD on trample or what?. He overall fits his warrior role for the most part specially with things like Bite or Larder being heroic choices to self sustain him. He's big, fat and smells like death himself died and was left in the sun for a month which is exactly what Ghom is haha xP plus you added his stomach based combat and the spewing reminds me of Brambles in HoN. 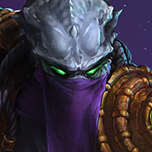 For the most part he interacts well as an ally hero though i could see his collision causing problems for allies while at the same time for enemies its the counter side of things, the rest of him acts very well as a tank and even seems more of a Solo tank role then Garrosh was claimed to be. I was going to score lower on Interaction and Cohesiveness but i figured alot of the concept makes up for it since we can't give 0.5 score markers, can't wait to see his talents roll out to work with his abilities. "...how does his Trample trait work with the large collisions he would also causes? noticed that a few times there and is it a CD on trample or what?." Essentially, this TYPE of unit collision avoidance doesn't exist in the game yet. Dehaka's W removes collision from him entirely, making it impossible for him to body block. In the case of my design, imagine a wall around Ghom and his target with both inward and outward faces. First, the player can not issue a command that will lead into Ghom's outward facing wall, only around it. Ghom won't have that restriction. His pathing will always take him through outward facing walls of unit collision, while the enemy pathing will always have to reconfigure. Second, if Ghom is currently ON TOP of a unit, orders that the enemy player sends would not TECHNICALLY be bumping into an outward facing wall of Ghom's circle, and therefore continue because they aren't obstructed. Does that make sense? Current design is no cooldown. It is permanently active. "He overall fits his warrior role for the most part"
Is it against the rules to ask what it is that makes you say that? "...i could see his collision causing problems for allies..."
Now that makes alot more clear sense on his collision style :D and always welcome to ask judges anything though i would say its better in the CDC thread itself, and he really does fit a warriors role in that he holds the line so to speak and he can cause havoc that makes enemies have to think 'do we risk letting him at our support? or do we try to get around his fat ! @# to get to theres' while he does lack a baseline stun effect that some warriors (whether full or mini) he fits the rest that qualifies a warrior, i hope that made any sense considering i only just woke up haha xP. It does, thanks. I had hoped the "Confuse" debuff would fill that stun role, but I agree it's not as much of a hard stun as a Muradin Q.
I myself have pondered how to utilise the Confused status and how to implement it without turning into a Fear or Silenced copy myself for awhile but never had a concept to match it, one day i intend to maybe create a discord channel or something and throw down things like that to help fellow concept writers with ideas in the future, me and a few others already got ideas like Spellward, Berserk and my personal favourite the Dispelled status effects. It does work with Ghom at least since a noctious gas can disorientate a person and confuse them easily. Altered Trample to say "overrides" instead of "ignores." (Pending question) Changed collision shape during the collision restoration of Swell. Made Larder a targetable line instead of random. Made level 20 upgrade for Bite only remove 25% of health instead of lasting until the hero dies. Gave Belch a channel time to make it more of a skill shot like Brightwing's Q. (Pending question) Altered level 1 quest talent to be a better defense against % damage. This was a surprisingly interesting read. Many people pay off Ghom as just another Stitches copy, similarly to how people hate on Roadhog, but you really created an interesting and unique character. I love the idea of a collision based warrior, body blocking enemies and dealing damage by doing so. I like the new slew of mechanics you’ve brought it, with directional autocast, the new Confuse CC, and especially the size growth mechanic. All of the talents are interesting and engaging in their play, and it was quite pleasing to read through them. All in all, I was really impressed by the abilities you introduced here. The kit really does roll together into a big and in charge warrior who overrides the movement commands of others and disrupts them in a variety of ways. Your kit has several indirect connections within that really binds the concept together. 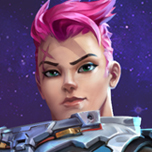 The talents are quite well done, with several layered themes and playstyles emerging, but not at the sacrifice of tier cohesiveness. You managed to strike up a good balance throughout the character, and it was quite nice to read through. As Damian mentioned, the idea of a monstrous, oppressive, revolting mass of flesh is the goal you were aiming for, and it fits Ghom perfectly. The talents all felt very much in line with the character as well. Good job. My only problems with the character some of the unintuitive designs and uncounterable mechanics. The instant nature of his abilities is already a bit unfortunate, but the addition of the random nature on his first heroic, the infinite bleed on his Tier 7 upgrade for his second heroic, and the way you describe Trample all contribute to a less than perfect style. While his range is quite low, he can be countered by % health damage, and each of his abilities introduce ways within them to counter the abilities, I am concerned by the fact he can push enemies around by walking into them. I would make it so he can override enemy movement commands and push them to the side as opposed to just pushing enemies back. I get the idea, but I feel it might be a bit unintuitive and obnoxious. I would also update the baseline tooltip from “ignoring unit collision” to “overriding unit collision”. Just a thought. Couple points of clarity, though. First, the only time Ghom can override player inputs is with the Confusion debuff. It causes the hero to travel in the opposite direction of player input. Trample does not override player input, it gives Ghom the ability to travel inside their collision zone. If the center of their collision zone over gets INSIDE Ghom's collision zone, they enemy player can STILL issue orders that will take them OUT of Ghom's collision zone no matter what direction they travel. Second, Ghom can not "push" enemies with Trample (it's not like Chen's barrel roll). He can only walk on them. His collision works like everyone else's otherwise, meaning that if a command is issued in his direction, the pathing will take the character around him. The only time this isn't the case is when he is standing on top of them, in which case any order and subsequent pathing will actually ignore his collision. I can draw up a diagram if this doesn't make sense. The only time he pushes enemies is when he uses Swell, but that is because his Trample is deactivated and he needs a way to come back into the collision table without just immediately appearing. That's why he slowly pushes any center of collision that is within his own collision box until it is completely out. Is that where you think it would be better if everyone was pushed to the side instead of to the front or back of him? Like if his collision was restored in a sort of cylinder-on-its-side fashion instead of a circle? Also, I'm not sure what tank isn't countered by % damage, could you provide an example? Each of his abilities brings something interesting, particularly the trait, which is quite innovative. His talents affect his kit in better and more interesting ways than just number buffs would. While I wouldn't personally care for any of the proposed skins, I won't deny they are creative. Only issue I have is, I'm not sure where you got the idea of making Ghom behave "like a dog" in so many of his quotes and animations. His kit works well together and is appropriate for a frontline tank. For the most part you're good here. Ghom is a great choice for the contest and most of his kit and fluff fits him really well, but while I get the "disgusting giant demon" theme, I think you made him too much of a joke character, especially in his hearth animation. Personally, Ghom never really stroke me as a character who was supposed to be funny, so I think the fart jokes are a tad overemphasized, to the point where I feel it no longer really fits the character. I don't see any major problems here. While both his trait and the confusion mechanic could be frustrating to play against, you don't use them in an unfair way at all, so it's just a matter of adapting and learning to play against them. He could be annoying for his team if he gets in the way too much after using his E, so maybe consider moving "Squeeze On By" a little earlier on his talent tree? Hey mate i used your Confused status for the concept writers discord as a Fan Made Debuff Effect and added a little more detail to it for ya (you still get full credit) to give people a view of how it works, will remove it if you don't want it there though mate so lemme know.